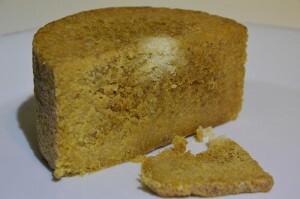 A pungent, golden-brown cheese with a crusty texture and a strong flavor, Gamalost is known for its health-promoting characteristics. Made from skimmed cow’s milk with no other ingredients added, Gamalost contains more than 50 percent protein and just 1 percent fat. It also contains chitosan, a substance that has many beneficial properties, including lowering cholesterol. The Vikings, who fueled themselves for their expeditions in part by eating Gamalost, also considered the cheese an aphrodisiac. 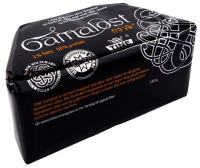 Gamalost was once a staple of the Norwegian diet, in large part because it could be stored for long periods of time without refrigeration. But because of the difficult production process, the tradition of making it now lives on only at the TINE dairy in Vik, which produces about 150 to 200 tons of Gamalost per year and has also developed a spreadable version. Norwegian authorities have even granted the brand Gamalost frå Vik special protected status because of its importance as a piece of the country’s cultural heritage. Although the tradition of making Gamalost is an old one, the name of the cheese comes not from its long history but from the length of the aging process. Traditionally, after the milk had been soured, the curds were heated in copper cauldrons, and then transferred to wooden moulds lined with jute or linen. After a few days the cheese was wrapped in dried marsh grass in preparation for aging. Every other day during the maturation process, the cheese had to be rubbed by hand to faciliate the absorption of the necessary bacteria. These days, modern dairy production methods have reduced the aging process from an entire summer to 12 to 14 days. Still, the principles of making Gamalost remain the same, with much of the work done by hand to obtain the best quality and aroma. Its health benefits notwithstanding, Gamalost is not to everyone’s taste. The cheese continues to mature after production, so its strong flavor and aroma intensify over time. Just the mention of Gamalost will cause many people to wrinkle their noses. But served the way the connoisseurs eat it — on a slice of bread with a dollop of jam, honey, clotted cream, or maple syrup — it’s really quite tasty. Some Norwegians even marinade Gamalost in port, sherry, brandy, or aquavit. If you’re traveling in the Sognefjord region and want to learn more about Gamalost (and maybe even brave a taste), stop by the café at the TINE dairy, just a block or so up the hill from the passenger boat dock in Vik. Gamalost even has its own festival, which takes place in Vik over several days in late May or early June. I am going to fly from England to Norway to buy this cheese! Love it – wish they would export it! I hope you get to Vik soon to get some gamalost! It’s definitely a rare commodity outside that small region. Is it possible to get some gamalost cheese sent to Australia? This blog is unaffiliated with the gamalost dairy in Vik, so you’d have to contact them. http://www.tine.no/om-tine/meieriene/spesialprodukter/tine-meieriet-vik (the page is in Norwegian, but there’s a link to their Facebook page, as well as a phone number and the e-mail address of the dairy manager). 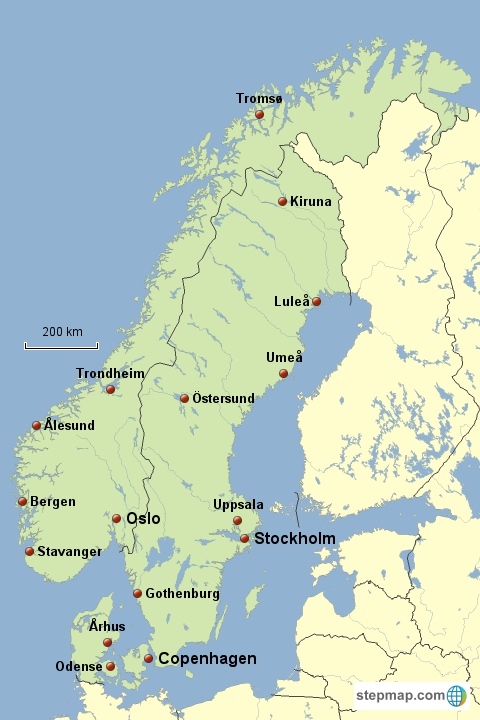 However, I seem to recall being told that gamalost doesn’t travel well; it’s not even available in all parts of Norway. Then of course there’s the question of importation laws in Australia. I find it hard to believe that it doesn’t travel well, considering what I’ve learned in this fascinating article. I’m going to see if our top-notch grocery chain, famous for bringing in foods from all over the world, can get some. Their cheese selection is outstanding, and they might be proud to do it. I have no idea if it really goes back to Viking times (I don’t think there’s any direct evidence for this), but I do know that it’s well worth a taste! Annika, there seems to be a contradiction between the idea that the cheese doesn’t travel well yet in the article it states that, “Gamalost was once a staple of the Norwegian diet, in large part because it could be stored for long periods of time without refrigeration.” Those two statements seem at odds, and if this truly was Viking food, it would need to travel well, and be able to keep for long periods without refrigeration. Perhaps the newer process, with shorter aging, makes a big difference. Or is there some other explanation? You’re right about the apparent contradiction, Ron, but I honestly don’t know. Regarding the “doesn’t travel well” thing, I thought I remembered people at the dairy saying something to that effect and explaining that that was one reason the cheese is so localized. But I could be wrong — it’s a few years since I visited (and since I wrote this article). The statement from the article about it being able to be stored for long periods without refrigeration is confirmed. I don’t know if the newer process has affected anything. From what other commenters say it certainly sounds as though it used to be imported to the US, anyway. But as far as I’m aware, it isn’t currently, but that may be because it’s not produced in great enough amounts. There could be a big difference between Storing well and traveling well. when stored, the conditions are controlled to a point that it helps prevent spoilage. in traveling, the conditions are less than ideal, to say the least. My father told of a shipment of Gamalost that came in to New York by ship years ago. Upon inspecting it the customs agents determined that the cheese must have gone bad and threw it all out. So, it travels just fine, until it encounters bureaucratic nonsense. Sounds disturbingly plausible, and could resolve the apparent contradiction. A friend of mine was taking it back to Israel. His luggage was investigated and the conclusion was that this had to be explosives. They cut the cheese to small pieces. He tried to explain, but was not released before he had eaten half the cheese. Luckily he got the rest of the cheese with him. My dad used to buy it in a Norwegian deli in Brooklyn. To call it pungent is being kind. We called it stinky cheese and I would say it makes Limburger smell like French perfume. Our aunt once threw it out thinking it went bad. Dad was from Vesteralen and it was a special treat for him. Is anyone willing to share the actual recipe including the process? I have made my own cheeses from cows and goats milk for several years. I would like to give this a shot. My grandfather, the last of the family born in the old country, ate Limburger instead (and once got into trouble for eating it in the house when Grandmother had company.) I have seen it for sale in Chicago once, at the late, great Wikstrom’s Deli in Andersonville. ‘Twas tasty! Thank you for sharing! So this cheese also is good for hypertension as an ACE inhibitor. I am going to see if this is imported into Canada. If not, perhaps it could be shipped here via postal express from Norway. There must be a place in Canada to find it. Is it available in Bergen? I’ll be there next week, I’d love to try some. I should think you’d be able to find gamalost somewhere in Bergen, though unfortunately I don’t know any specific places that carry it. I would try one of the larger supermarkets; if they don’t have it, perhaps somewhere at the deli counter will have a better idea of where to look. Also, at the fish market by the harbor there are usually other products besides fish for sale, and I know I’ve seen some cheeses there, although I don’t specifically recall ever seeing gamalost. Might be worth checking just in case. Good luck! Yes, it travels well. Yes, you can get it online. Yes, it has a strong odor. Yes, it is good. I’ve served it in Ventura, CA. Thanks for your comment, Wayne. That’s good to know. Do you happen to remember where you’ve seen it sold online, or where you bought it in California? You can order it through Amazon. Just got a shipment today from Norway. Had a taste and I can say it’s not for the weak-of-stomach. The taste is powerful, as is its perfume. I ordered it off of Ebay…and I’m happy I did. It is a singular experience.